Drug dealers in Peru may never look at Santa Claus in the same way again, after police dressed as Father Christmas raided their home and arrested them for possession of cocaine, ruining their chances of a White Christmas. Video footage from Tuesday’s raid shows a man dressed in a Santa outfit break down the front door of a home in north Lima before undercover officers stormed inside. Four members of the “Pinto” drug gang were arrested, with more than 4,500 wraps of cocaine seized at the scene. The officer dressed as Santa later dons a large Santa head to complete his look as he searches the suspects, before leading the arrested men outside. According to Colonel Jorge Luis Angulo, chief of the squad that conducted the raid, the decision to dress up like Santa was to allow for the element of surprise and speed. "He breaks down the door because he has judicial authorization, so that makes it easier for us to be able to raid, quickly penetrate that property and be able to arrest the people inside, obviously involved in the issue of selling small amounts," he said. 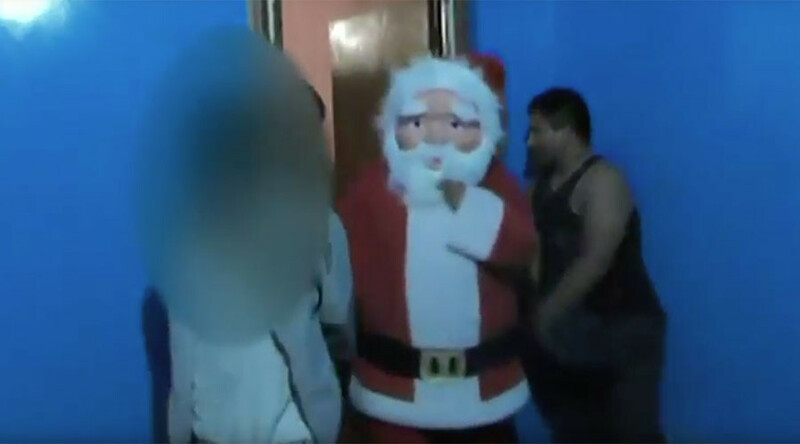 Last year, police in Peru conducted a similar raid, this time using two Santa Clauses.